Today, there are more platforms than ever that give you the ability to reach an audience and market your products or services online. From producing digital marketing on Facebook to LinkedIn to Google Ads (formerly AdWords) to Amazon, they all have different capabilities depending on your industry. Most importantly, they all attain a different customer acquisition cost. For an executive to make profitable and effective decisions that set your organization up for success, this ‘customer acquisition cost’ or ‘cost per acquisition’ is one metric that deserves an extra amount of your attention. With so many platforms and so many industries, it can be difficult to know what the benchmark average costs are, and knowing these can ensure your business is making profitable digital marketing decisions. For example, if you’re marketing for a CPG organization, it makes sense to leverage Google Search, Display, and Shopping ads to increase traffic and drive sales to Amazon or your online store. 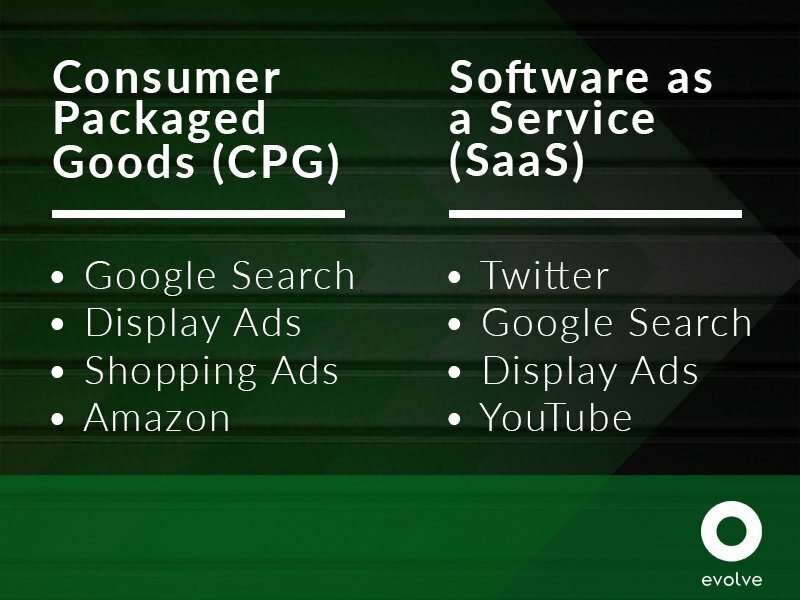 Whereas, if you’re a SaaS organization you’d most likely want to leverage a Social Media platform like Twitter with Google Search, Display, and YouTube to market your software product. But before we get into customer acquisition cost by industry and platform, let’s define cost per acquisition. Cost per customer acquisition is different than cost per lead or cost per click. The problem with digital marketing today is that cost per lead or cost per click are, by far, the most talked about metrics of PPC marketing. In its simplest terms, your customer acquisition cost is how much it costs your business to acquire a new customer for any certain marketing platform or industry. For any business or organization to calculate its cost per customer acquisition you simply take your total media costs for a certain campaign or platform and divide them by how many new customers were acquired in that campaign and you have your average cost per acquisition. For example, if a CPG organization spent $1,000 on marketing in their fiscal year and acquired 100 customers off that spend, then their cost per customer acquisition is $10. What is the average Google Ads cost per acquisition by industry? Since digital marketing is all about the competition within each industry, the costs also mirror the popularity of the market. If a certain keyword has very high search volume like finance or healthcare, it’s going to increase your budget and spend if you want your ads on the first page of Google search results. Whereas, if you’re bidding on keywords that don’t have high search volumes, your costs are going to be much more reasonable because of the lack of popularity within search engines. What’s the average customer acquisition cost by marketing platform? Similar to marketing per industry, every platform’s cost will vary due to the number of users present on each platform. If your organization is looking for the most bang for your buck, we’d recommend social media marketing and email marketing. The level of specificity your messaging and content can attain is simply amazing for the cost levels. If your organization has the budget, we’d recommend Google Ads search and display marketing while leveraging video marketing like on YouTube. Paid search, otherwise known as PPC marketing or search engine marketing, is the most popular form of online advertising. The costs for producing Google Ads are reasonable compared to traditional media forms depending on your industry and the ability to target-specific and granular audiences is unmatched. Look to Google when you’re in need of the most effective top-of-funnel strategies to grow brand awareness and bring users into your brand family. Google Ads: Without a doubt, Google Ads (formerly AdWords) is the most widely used digital marketing platform in existence. Bidding on auctions gives your organization the ability to put your products and services in front of billions of people every day. Bing: A secondary option to Google’s Ad platform is Microsoft’s Bing. The platform provides an almost identical advertising experience, but if you’re looking for the most widely used space, we’d suggest Google Ads. How do Google & Bing charge advertisers? Paid search ads in Google or Bing are priced on a pay-per-click (PPC) strategy. Your organization will be charged every time a prospective customer or user clicks on your ad. Every price per click is based on how competitive your chosen keywords are, and this is dependent on your industry and your organization’s Quality Score. If you’re looking to learn more about Quality Score check out this blog post. Google’s customer intent signs and signals are full of informative data that very few other marketing platforms attain. The more comfortable that humans get with search engines, the more specific and natural our queries become. If you strategize your Google Ads marketing campaigns correctly and properly analyze your customers search behaviors and questions, then you already know their pain points and jobs-to-be-done. Taking this data-first approach to marketing will make it easier to reach your true audience with very specific messaging. Knowing which platform attains the lowest cost per customer acquisition is vital for any executive trying to innovate their marketing strategy. When you know what platforms deliver the most customers and conversions at the lowest cost, you’ll know where you can hone your marketing focus for maximum and predictable growth. Ensure your keywords are targeting your true market audience. Utilize negative keywords to eliminate unnecessary clicks from customers who aren’t willing to buy your products or services. Constantly test your website landing pages that you’re driving customers to. Make your ad-to-landing-page experience seamless and ensure all the messaging and imagery is consistent and relevant so you can achieve an above average Quality Score. Facebook has become by far the largest and most competitive platform for social media marketing. So much so, that over 90% of marketers are using Facebook to reach their audiences with their products and services. If you’re looking for a successful top-of-funnel marketing strategy as well as an incredible platform to improve customer relation management, Facebook might be the right choice for your business. Facebook marketing is slightly different than marketing on Google. There’s a level of intrusiveness that needs to be attained in social media marketing that may not be as prevalent on other platforms. Users are scrolling through so much content at such a rapid pace that your advertising needs to capture their attention over their friends and family’s pictures and posts. That’s why we’re seeing the usage of carousel ads, videos, and slideshow ads to help organizations tell a more inclusive and holistic brand story. How does Facebook charge for their marketing? Like Google, Facebook charges your business or organization on a cost per click basis. Because of its popularity among businesses, Facebook has become the most expensive social media marketing platform, so in the same retrospect, the more specific you’re targeting your audiences the more efficient your cost per customer acquisition will be. Almost everyone has a Facebook account no matter the age. In fact, even with audiences that are over 45 years old, Facebook is by far the most widely used social media platform. Facebook advertising also allows you to spread your marketing across multiple user devices all over the globe, so whether your audience browses on their phones, their laptops, or their tablets your organization has the ability to reach them with your marketing. Similar to how Google’s Quality Score is based on the relevance of your advertising and messaging, Facebook’s incredibly specific targeting capabilities will help your organization speak to a true market audience and use your budget wisely. It’s best to stay away from broad targeting tactics if you’re looking to lower your cost per customer acquisition because as more people click on your ad, the more it costs your organization. Effective marketing on Facebook isn’t about getting as many clicks as possible, it’s about getting the best clicks that will turn into customers. That’s done with great targeting. Over the last year Instagram has made a push to become the second largest social media advertising platform with a staggering 500 million everyday users, and of that 500 million, 80% are subscribing to business accounts. If you’re looking for a successful top-of-funnel marketing strategy as well as an incredible platform to improve customer relation management, Instagram might be the right choice for your business. Due to its visual nature as a platform, Instagram has proven quite successful for many fashion, health and beauty, and CPG organizations in their attempt to increase sales and customer conversions. The video and image-rich content that brands produce truly allows users to become a part of your organization and spread awareness about your products and services. How does Instagram charge for their advertising? Instagram charges marketers on a cost per click format much like Facebook. Prices are significantly less expensive than marketing on Facebook, but at the same time, you’re advertising to less than half the number of users found on Facebook. Due to Instagram’s prompted post strategy, businesses have the ability to build an incredibly in-depth relationship with their audiences and do it at a much lower cost per customer acquisition than Facebook or Google. Most digital marketing found on Instagram is incredibly mobile friendly because that’s where the majority of your users are accessing the platform. So, if your true market audience is a younger demographic and very mobile friendly, this could be a very cost-effective advertising platform for growth. Relevance of marketing content is the quickest and most efficient way to decrease your cost per customer acquisition on Instagram. Your marketing team must know how your true marketing audience likes digesting content and the style in which it’s presented. Since Instagram is a visual-only platform the usage of inexpensive video content is always the fastest road to success. In addition to producing eye-catching video and images, we’d suggest researching relevant and useful hashtags and utilizing them in every post. Hashtags are one of the best ways to automatically get your brand in front of an audience that’s interested in your industry. Twitter is the third largest social media platform for marketers to promote and sell their products and services. With an average monthly user rate of 330 million people all over the world, your organization has the ability to reach an enormous audience anytime and anywhere on their news feed. For small to medium businesses, Twitter has become an absolute blessing for marketing, and in addition to that, it’s allowed customer relation management to reach new heights. If you’re looking for a successful top-of-funnel marketing strategy as well as an incredible platform to improve customer relation management, Twitter might be the right choice for your business. Top organizations are using the platform to not only reach new audiences but also to manage relationships with current customers in need of solving pain points. For a social media platform, Twitter’s marketing costs are quite a bit lower per engagement compared to the Facebook and Instagram. However, at the same time, engagement is increasing on Twitter so be cognizant of that when marketing on Twitter. If your organization’s main source of marketing content is video, we’d highly suggest utilizing Twitter. The conversion rates on video content are incredibly high and due to an extended character limit, marketers are able to tell more developed stories and messaging to attract their true customers. For example, Nielsen produced a study based in the automotive industry that showed 1 out of every 4 cars purchased was influenced by Twitter at some point in the car buying process. How does Twitter charge for their advertising? Twitter charges marketers on a cost per click format much like Facebook. Prices are significantly less expensive than marketing on Facebook, but at the same time, you’re advertising to a much smaller number of users than found on Facebook. The great thing about marketing on Twitter is the ability for your content to be shared by Twitter’s users for free. Creating viral content is no easy task, but if your messaging and marketing is specific and interesting enough to your target audience, your users will spread your messaging to other users like wildfire. It’s an incredible platform to build brand awareness and increase sales. Unlike Google that has a Quality Score, Twitter doesn’t grade its marketing content. However, by simply producing ads that feel like ads your organization will more than likely experience wasted budgets and a higher cost per customer acquisition. No matter the marketing platform, relevancy of your content to your is of the utmost importance. Users are bombarded by so many marketing materials on a daily basis that they’ve learned to automatically turn off their attention when they feel like they’re being sold to. Creating useful and valuable material for your users is the quickest way to decreasing your cost per customer acquisition on Twitter. LinkedIn has very rapidly become the Facebook for professionals and B2B marketers. So much so, that a staggering 94% of B2B marketers are utilizing LinkedIn for its digital marketing purposes to gain an increase in leads and share their content. Within the last few years, their user rate has skyrocketed to 260 million users per month. It’s where the majority of Fortune 500 movers-and-shakers are spending their time on social media, so if you’re in the B2B marketing industry and if you’re not already on LinkedIn, we’d suggest you go sign-up for your account now and immediately strategize some content. In addition to producing marketing content to increase sales, a large majority of businesses are leveraging LinkedIn as a recruiting tool to gain new employees. If you’re looking for a successful top-of-funnel marketing strategy as well as an incredible platform to share marketing materials and increase brand awareness, LinkedIn might be the right choice for your business. As users become more comfortable navigating and accessing LinkedIn daily, we’ll see an evolution in how content is delivered to consumers. A large plus side to advertising on LinkedIn is that there’s far less competition compared to platforms like Facebook, IG, and Twitter. Any advertising content your brand produces doesn’t have to battle for attention next to their family and friends posts, their favorite ESPN feed, among many other distractions that take potential customers away from your products and services. How does LinkedIn charge for advertising? LinkedIn charges marketers on a cost per engagement format much like other social media platforms. For B2B marketers the advertising prices can be a bit pricier than marketing on other platforms, but at the same time, you’re advertising to the number one B2B space where 90% of decision-makers in Fortune 500 companies spend their time on social media. The great thing about B2B marketing on LinkedIn is the ability for your content to be shared by its users for free, without most of the other distractions that bombard customers on competitors social media platforms. In addition to video success on LinkedIn, their slide-share capabilities have given them a leg up in marketing communication between organizations. If your organization is in the B2B space, it’s an incredible platform to build brand awareness and increase sales. Producing valuable and relevant marketing content is the quickest and most efficient way to decrease your cost per customer acquisition on LinkedIn. Your marketing team must know how your true marketing audience digests content and the style in which it’s presented. Since LinkedIn is a visual preferred platform the usage of inexpensive video content is always the fastest road to success. In addition to producing eye-catching video and images, we’d suggest researching relevant and useful hashtags and utilizing them in every post. When done right, email marketing is one of the most profitable and personalized tools in any content marketer’s toolbox. If you’re looking for one of the most successful full-funnel marketing strategies as well as an incredible platform to improve customer relation management, Email marketing might be the right choice for your business. The two main organizations, HubSpot and MailChimp both offer completely free versions that come with a myriad of features. One of the most utilized would be the responsive email design feature, which allows you to optimize for desktop or mobile platforms. They also have multiple design templates suitable for most businesses and industries. However, in order to successfully use email marketing, your company needs to have a robust and updated email list. If you already have one, perfect, you’re ready for the next step. If you don’t have an email list formulated, read the bullet points below. Offer free and valuable downloads on your website. Always request a name and Email in order for the prospective customer to acquire the materials. Produce useful pieces of content on topics that are relevant to your desired customers and publish these on a regular basis. Write quality and informative blogs and videos, and request users to sign-up to receive notifications on updates. Create an easy and seamless sign-up or contact form on your website’s homepage. Use your social media channels to gain prospective leads. How do Email and CRM platforms charge marketers? Normally, most CRM platforms for email marketing are paid on a monthly rate depending on the features and capabilities that suit your organization. If your business has tens of thousands of leads and you’re pushing them through in-depth sales and marketing funnels we’d suggest paying for a version instead of just using a free version. Email marketing is one of the least expensive forms of digital marketing and its ability to be personalized and incredibly specific towards an individual is unmatched from any other advertising platform in existence. A/B testing is the key to reaching more customers at a lower cost per customer acquisition. Your organization has the capabilities to produce HTML emails or very straightforward and simple text design emails. No matter the style, or how long or short the copy presented in the email, there must always be a specific call to action for your target audience to complete. Make it useful and help them complete any issues in their lives that relate to your business. The amount of data your organization can receive within emails is astounding. Plus, if you leverage a paid version of a CRM like HubSpot, you’ll be able to view a users journey to a specific landing page on your website. From there, you’ll have the ability to build user-specific content that’s tailored to their pain points or interests. When your organization utilizes direct response email marketing to prompt your potential customers to visit your other social channels you’re bringing them deeper into your brand community and allowing your company additional avenues to communicate, nurture and pursue this customer, and hopefully decrease your cost per customer acquisition. Also, by leveraging useful downloadable pieces of content or videos in your email marketing will certainly lead to a lower cost per customer acquisition as well as happier customers. As the world’s leading eCommerce platform, every year Amazon continues to grow its profits, sales, and active customer list. If your a CPG organization looking to increase your conversions with an efficient bottom-of-the-funnel sales and marketing strategy, we highly suggest producing advertising on Amazon. How does Amazon charge for advertising? Paid ads on Amazon are priced on a pay per click strategy. Your organization will be charged every time a prospective customer or Amazon user clicks on your ad. Every price per click is based on how competitive your chosen keywords are. This is dependent on your industry and your products popularity within Amazon’s search engine. Amazon is quite different than any other platform because when customers browse they’re already closer towards making a purchase decision. On a platform like Google, they’re searching for answers to their questions and solutions to their problems, on Amazon they want to buy it now and get it tomorrow. If your CPG organization can identify actionable data around what your true market audience wants, you’ll be able to present personalized messaging to millions of users who are already willing to buy. To dominate your competition, we’d suggest leveraging a remarketing service like JumpSend, which allows your organization to send personalized emails to consumers when they search one of your chosen keywords into Amazon’s search box. By strategizing your messaging based off your true market audience’s intent, you’re giving your organization a leg up over your competitors. In the same way that keywords are your blueprint for advertising in Google, Amazon also has what they call backend keywords that populate your Amazon page. By choosing the keywords that attract your true market audience you’ll surely see an increase in sales and a decrease in cost per customer acquisition. In addition to keywords, if your CPG organization doesn’t have an ample amount of reviews on your page you’re doing your organization a tremendous disservice. 90% of Amazon users won’t purchase a product that has less than three stars. Try offering discounted product or free give-a-ways to certain consumers in exchange for positive customer reviews. On top of reviews and keywords, 60% of Amazon shoppers have noted that slow shipping will prevent them from making a purchase. Ensure that your organization has blazing fast shipping time to continuously increase sales and lower your cost per customer acquisition. After digesting all of those different advertising platforms we hope your organization has a better idea of what platforms to utilize and how much it should be costing your business to acquire a customer. However, because the modern consumer’s user journey has expanded over the years, we’re seeing them seamlessly switch from platform to platform, so we would recommend focusing your advertising content to several of these platforms to truly achieve predictable growth. If your organization is still shaking its head over customer acquisition costs and what strategies your company should implement to increase brand awareness and maximize profits, reach out to Evolve Digital Labs for your free consult. Was this article helpful? Sign up below to receive new information from Evolve Digital Labs directly in your Inbox.